A fascinating book that re-examines countless theories about who discovered and first settled in NZ and the Pacific Islands.Media speculation about who 'discovered' NZ (Spanish? Phoenician? Portuguese?) 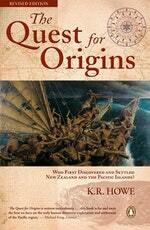 has provided continuing evidence of New Zealanders' fascination with our origins and where we've come from. The Spanish helmet, the Tamil bell, the Korotahi bird, and so on and so on all focus on other explanations of our origins and settlement. Was Tasman really the first? What about the Spanish galleon buried in the sand off Dargaville? And didn't the Maori come from South America? Or were descended from the Hopi Indians of the US?In this provocative and fascinating book Professor Kerry Howe traces dozens of explanations and theories of both pre-Maori and pre-European settlement and assesses each one. At the same time he places them in their intellectual, historical and cultural context. The book uses maps and illustrations and scholarly research but is carefully written for a general lay audience and is not an academic book. Love Quest for Origins? Subscribe to Read More to find out about similar books.